We are exclusive distributors in Sweden of air safety equipment by a range of leading brands and we design and manufacture own products for the civil and military markets. This page shows our most popular products. Please contact us with your requirements and we will assist you in finding the right product for you. We design and manufacture cargo nets for aircraft and helicopters. Airsafe delivers cargo nets to operators such as West Air Europe, Saab and the Swedish Coast Guard. Airsafe Safety Harnesses for aircraft and helicopter crew are light, comfortable and compatible with several oxygen systems. They can be worn beneath a life vest or combat vest and have been developed in cooperation with the Swedish and Norwegian national defence organisations. We customise lifeboats and liferafts and are exclusive distributors in Sweden of products from RFD Beaufort. For fast recovery when time is a factor: the Airsafe Oil Sampling Buoy is a flotation system for marking out and sampling environmental pollution. It is also suitable for locating persons in distress for SAR operations and can be fitted with a VHF transmitter to assist recovery. Airsafe is the Nordic market leader in parachutes and parachute systems. We customise parachutes for a range of uses together with Airborne Systems and offer parachute systems for personnel, aerial cargo delivery, weapon delivery, recovery and aircraft retardation. Preventing parachutes from sinking after landing on water, the Airsafe Parafloat is a small and handy unit that attaches to the parachute harness. When in contact with water, an inside bladder inflates to keep the parachute afloat for at least 15 minutes – sufficient for a safe pick up. The Airsafe Quick Release Restraint is a flexible construction for temporarily securing life rafts and other heavy items in aircraft and helicopters. It is easy to operate single-handedly and made to endure rough day-to-day handling. Safely securing your liferaft has never been easier. Developed by the Swedish Armed Forces Survival Centre and designed by us, the kit is currently in use by Swedish troops during deployment. The SERE kit is small, light weight and conforms to NATO STANAG 7196 with equipment for transmitting Recovery Activation Signals. Airsafe Sweden manufacture soft air targets in different sizes with different characteristics. We also provide maintenance and repair. Please refer to the Product Sheet for our current range of products. Fully customised soft air targets are manufactured on request. Eliminating the need for ground support, the Wind Indicator is an easy-to-use utility deployed at altitude by the parachutist to assist with the final approach by displaying current ground wind direction. For usage in darkness, an extra night kit with light sticks and a strobe light is needed to improve visibility. 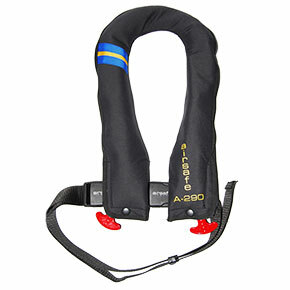 Airsafe designs and manufactures life jackets. Product names and brands are the property of their respective owners. Airsafe Sweden AB is not responsible for the content of linked external websites.